How do I install GNOME Shell extensions? Is it possible to update, remove and manage the extensions? With the gnome-tweak-tool come some pre-installed but not pre-enabled extensions, you can view these by opening the gnome-tweak-tool (you can either run this in Terminal (CTRL + ALT + T) or you can search for Tweak Tool in the Activities Overview) and going to the Extensions section. The GNOME Shell Integration Firefox plugin. After you have installed both of these you will need to restart your browser for the changes to take effect. 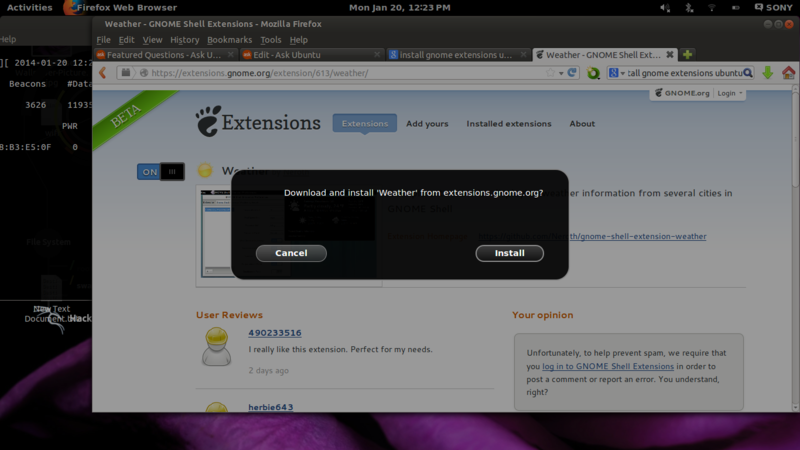 Then you will be able to browse and install GNOME extensions from here. Enabling this plugin allows the website to detect your GNOME version as well as to install and manage your extensions. The plugin should be installed by default in Firefox 52 and below on Ubuntu GNOME. The GNOME Shell Integration Chrome plugin. The native GNOME "Web" browser Epiphany still supports NPAPI plugins and has the necessary GNOME extensions plugin pre-installed and thus there is no need to do any setting up with it. The most popular extensions will be displayed on the initial page you get to, you may however choose to sort page contents and search results using the Name, Recent, and Downloads filters. You can also choose to display results for All versions as opposed to just the Current version you are running (attempting to install extensions not compatible with your version of GNOME will result in a silent failure - the operation will not be successful but you will not be notified of this in any way - though extensions which are not compatible will be slightly greyed out in the results list so you will still be able to tell even with the All versions filter selected). You can also use the search box to find extensions, once you have found an extension you wish to install (if you are concerned about the safety of the extensions then you should read this information on the review process - go to the Are GNOME Shell extensions safe? section - extensions have to go through before they are accepted onto the website), click on its name in the search results, then once you are on its page click the ON/OFF slider next to its name (as done above in the gnome-tweak-tool), you will get a dialog prompting you if you wish to install the said extension, if you do, press Install, if you have changed your mind, press Cancel. If you do not get such a dialog, you have just stumbled across one of your pre-installed extensions and activated it! 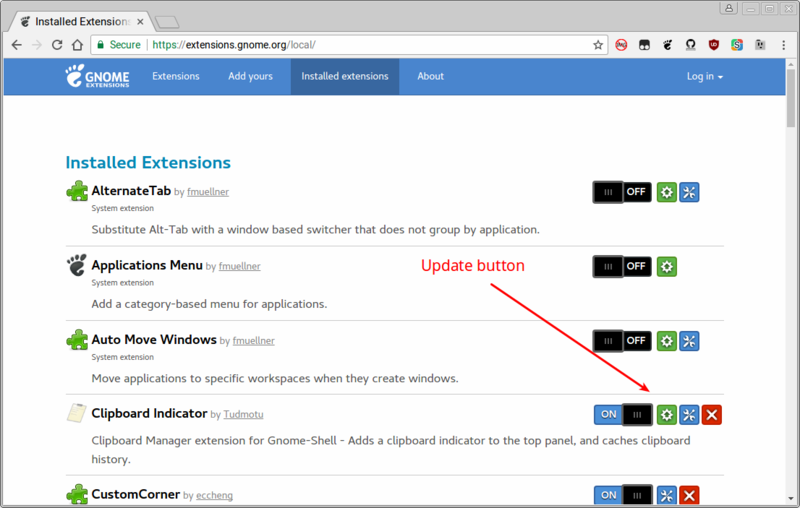 Once making changes to your installed/activated extensions from the website you will need to restart the gnome-tweak-tool in order for it to register the changes. In order to activate an extension click on the ON/OFF slider next to its name and description so that its status changes from OFF to ON, (and visa-versa to deactivate it). You will see that the pre-installed extensions have a greyed out Remove button next to each of them, this is greyed out because they are pre-installed, if you install a new one however you will be able to use this button to permanently remove it. Clicking this button will enable you to alter the configuration for the extension in question (it should launch a settings window). The online view enables you to also do similar (though it also allows you to remove/uninstall pre-installed extensions, so tread carefully - though of course you will be able to re-install them again). You will then be prompted if you would like to Upgrade the said extension, pressing Upgrade will upgrade it, however pressing the Cancel button will disable or possibly even uninstall it so that you will need to reinstall or reactivate it again. This process should work for all those using GNOME 3.4+. To install an extension click on the extension and then you will go a page describing the extension. In that page you can see a slider switch. Turn on the slider if you want to install the extension. Then you will see a prompt to install the extension. Once you're on Installed extensions tab, you can upgrade any extension, disable and bring settings directly from the browser. You can find the update button next to the extension name when there is an update available. Click that button to update. You'll get a prompt similar to the one you get when you installed the extension asking the permission to install the extension. click on the Install button (Yes, it's not Update) to install the updated extension. 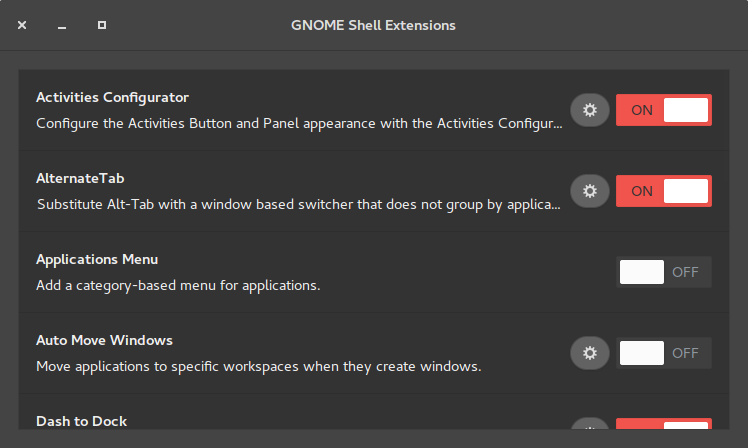 Though you can use gnome-tweak-tool, you can alo bring up the extension settings window from the site if the extension provides one. Just click on the small wrench icon. A settings windows should appear as shown in the following screenshot. You can also delete an extension from the site provided that it didn't come with gnome-shell by default (which makes them installed into the system area). Clicking the red cross mark should uninstall the extension. In Ubuntu 18.04 and later GNOME Shell Extensions can be installed from the Ubuntu Software app. Do a keyword search for "GNOME shell extensions" and the type of app you are searching for. You can also search from all of the available GNOME Shell Extensions on the same screen by pressing Add-ons button which is located under the Categories heading. 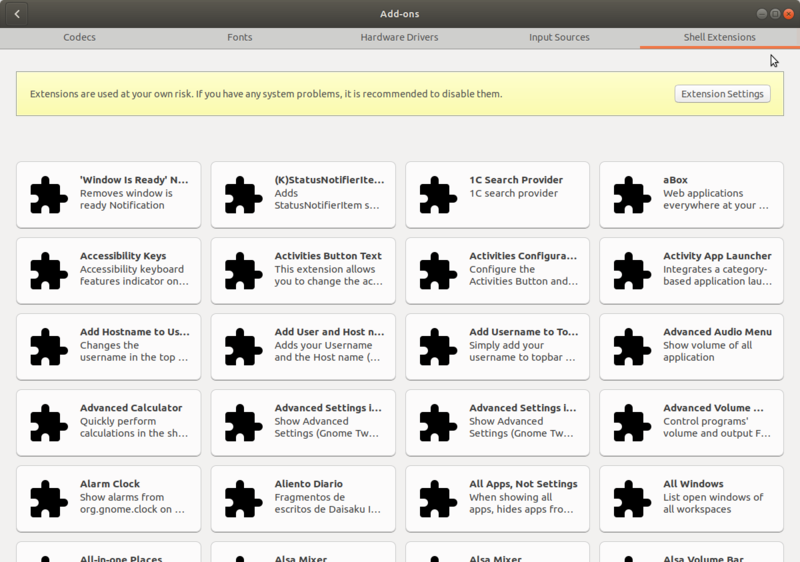 In the Add-ons screen select the Shell Extensions tab and you will see all the available GNOME Shell Extensions. Clicking on a GNOME Shell Extension in the list of search results will bring up its screen which will often show screenshot(s). Clicking on the Website button will open its website in a web browser where you can view a larger sized image of the same screenshot that was shown in Ubuntu Software. Clicking on the Install button will install the extension. 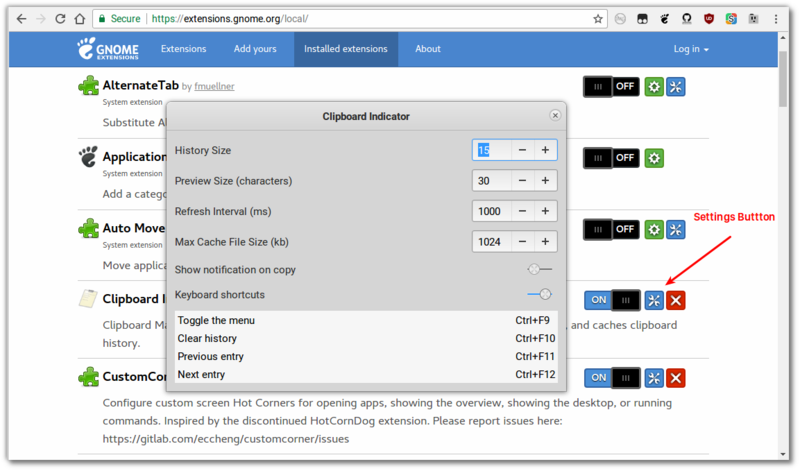 The GNOME website has an Extensions section set up, which is currently in its Beta phase. It promises easy installation of extensions, and management of installed ones, through a web interface. Go to the gnome-shell extensions page using a supported browser (that is not totally secured to anything running on or coming from the web). Like the stock gnome-browser or a clean install of Firefox should work as well. I sometimes had issues installing extensions using Google Chrome or Midori. Filter by "Supported by: Current Version"
A "install this extension"-question should pop up. Confirm. In rare cases you need to reload the gnome-shell to make a new extension work without issues (RARE!) - open the gnome-shell run dialogue (Alt+F2) - if not set check Alt+F2 doesn't display the Run Command Prompt in GNOME Shell), type in r and hit Enter. I have been going crazy trying to get this to work on a clean installation of ubuntu gnome 14.04. I have found the solution. Under the plugins, you will see Gnome Shell Integration. Select that and change the activation options to ALWAYS ACTIVATE. I then closed out firefox and then reopened. When I went back to http://addons.mozilla.org. I was able to install the extensions (The slider stayed in the on position. The extension did show up in the tweak tool after that. I hope this helps. I have read so many answers and tried so many things. I am just happy that I figured it out and I'm able to share it with everyone. Here is quick list of versions so you can verify against yours. Clean install of Ubuntu Gnome 14.04 Firefox 34. Version that was installed during installation. activate the extension and then press Alt + F2, on the command line enter r and press Enter. When you restart the GNOME shell (Alt + F2,r) the extensions may stop working. (Example: Dash-to-Panel). If you use the command gnome-shell-extension-prefs, in the application that opens, the extensions may appear as not activated. Yes, the extension installation feature is removed from GNOME Tweaks (since v3.26, the one in Ubuntu 17.10 if I remember correctly). To manually install extensions, simply extract the archive you got from the official site and copy/move the extension folder (usually of the form extension-name@developer-info) to your ~/.local/share/gnome-shell/extensions/ directory. Then re-login (or restart GNOME shell). The extension should appear in the (GNOME) Tweaks now. Activate it from there. Not the answer you're looking for? Browse other questions tagged software-installation gnome-shell-extension gnome-shell or ask your own question. How to enable user shell theme extension in latest Ubuntu 17.10? How do I install, update and remove GNOME Shell Extensions? How to fix no_gnome_shell (firefox 54)?